This secret spray works on EVERYTHING and smells more amazing than anything you can buy! Have you ever walked into a house that smelled remarkably wonderful and you had no clue why? That’s how it is for anyone who visits the house of Jen, who has a secret weapon when it comes to making every room of her home smell like a dream. It turns out that it’s not a magical potion. There’s an actual way to make your house smell as good as hers, and it’s surprisingly super simple and incredibly cheap. The secret is a homemade spray that resembles Febreze. But, this spray doesn’t have fabric softener in it and smells ten times better than the popular, expensive name brand. One bottle of the homemade stuff only costs 60 cents and will last the same amount of time or longer… unless you get addicted to the smell and use it nonstop! No promises! One ingredient really makes this DIY air freshener stand out from the rest, and that’s Downy Unstopables. If you haven’t seen or used them, they’re those little beads that you can throw into your wash to make clothes smell amazing. They come in a few different scents. 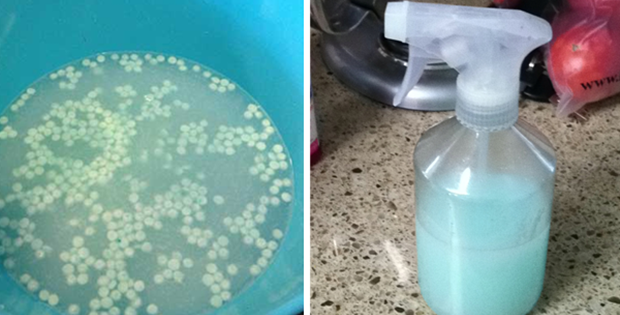 With a quarter cup of the Downy beads, you’ll also need four tablespoons of baking soda and one cup of boiling water! Plus, of course, an empty spray bottle. Then, use a funnel to pour the mixture into your spray bottle! Use the spray on pretty much anything. It works great on carpets, furniture, clothes, curtains, rugs, etc. Your dog will even love it on their smelly bed, and it doesn’t leave a residue or film behind. Now, you can join Jen in the club of homes that have an extra smell to them that no one can get enough of. Find all the details from her project here!